When it comes to pitching, Texas is not lacking in quantity. UT currently has 22 pitchers on its 2019 roster. Experience, however, is another matter. The MLB Draft recently swooped up four pitchers who were responsible for nearly 46 percent of the 569 innings thrown by UT pitchers in 2018. Parker Joe Robinson, who logged a team-best 1.71 ERA over 31 2/3 innings of relief, also signed with the Los Angeles Angeles as an undrafted free agent. That leaves junior Blair Henley as the only remaining Longhorn who threw more than 40 innings last year. So, how will David Pierce handle the pitchers in his third season as UT’s head coach? Pierce stopped short of saying his team will be college baseball’s version of the Tampa Bay Rays, who routinely gave a short start to a relief pitcher this past season. In fact, Pierce said that “I don’t want to use the model of what some of the professional teams are doing because to me, I don’t care about their model or another collegiate team’s model. It’s much more about our personnel.” There, however, will be some mixing and matching on the mound this season. “I think you’ll find somebody getting loose in the bullpen when somebody comes in,” Pierce said. “I mean that sincerely, because I think we have more quality arms with less experience. Texas does have two senior catchers in DJ Petrinsky and Michael McCann to lean on. Henley, an all-conference honoree who has started 26 times over the past two years, figures to be the team’s ace. Who will fill in behind Henley in the rotation, though, is anyone’s guess. 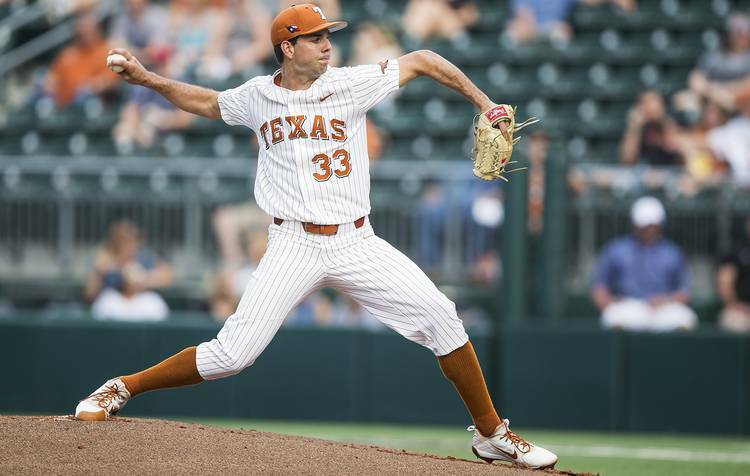 Senior right-hander Matteo Bocchi gives the Longhorns an intriguing option. A native of Italy who spent two years at Odessa College, Bocchi recorded a 3.05 ERA and 34 strikeouts over last season’s 21 appearances. Bocchi started only four times in 2018, but one of those starts was made in what was arguably the biggest game of UT’s season. In the decisive game of a super regional against Tennessee Tech, Bocchi led Texas to a 5-2 win with five innings of four-hit baseball. Bocchi told reporters last week that he worked on adding a curveball to his arm’s arsenal this off-season. He also expressed confidence that he can throw more this spring after working with a pitch count of around 30 pitches in 2018.